The Swedish Air Force was the main operator of the SAAB 91 Safir. In the period 1947-1992 ninety-nine served with the Swedish Air Force: 10 SAAB 91A designated Tp 91 as liaison aircraft; 75 SAAB 91B designated Sk 50B as basic trainer and 14 SAAB 91C designated Sk 50C as trainer. After the Sk 50B and Sk 50C had been replaced by the Scottish Aviation Bulldog as a trainer, they were used by all wings as liaison aircraft until retirement. The last Sk 50B was retired in 1990, the last Sk 50C in 1992. On 22 November 1952, SAAB 91B Safir c/n 91.211 entered service with the Swedish Air Force F 5 wing at Ljungbyhed as Sk 50B 50011. On 27 April 1972, the 50011 was transferred to the the F12 wing. Before the aircraft was retired from military service this Sk 50B served also with F 16 wing.On 22 June 1981, the 1952-built SAAB entered the civil register as SE-IIL. The aircraft was operated by a privat owner in a drabbrown/green camo in the Swedish Air Force F 5 wing colours, however the aircraft wear in military service its camo in service with F 12 wing. 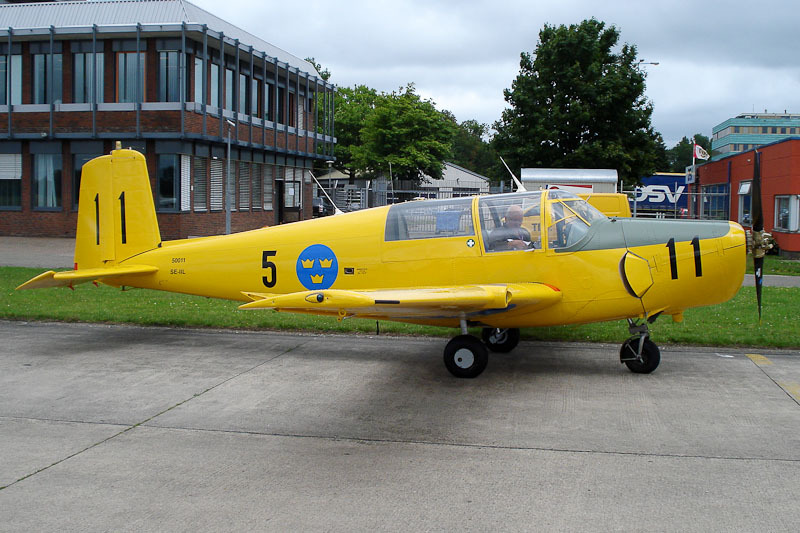 When the aircraft was photographed at Groningen Airport Eelde it was on its return flight to Sweden after it was freshly painted in the UK in the original yellow 'Swedish Air Force F 5 wing" colours.